Remote sensing techniques based on SODAR and LIDAR are gaining more traction in the wind sector than ever before. Our customers enjoy a considerable advantage using remote sensing. Why? Because remote sensing can sample data over a large area plus it can measure vertical profiles at the turbine locations. Now, you can further leverage remote sensing with new functionality we've introduced in WindSim. First, some perspective. Remote sensing techniques use Doppler shifted signals that sample the wind speed component along the beam of measurements. To derive all three wind speed components, an averaging technique is needed over a minimum of three beams of measurements. The basic assumption is that the wind sampled at each of these locations, by the three distinct beams, is identical. In complex terrain this is not true—the wind field is not homogeneous—so errors are introduced in the measurements. We've developed a Remote Sensing Correction Tool—sort of a missing piece—where our CFD simulated wind fields are used to adjust for the faulty homogeneity assumption. Combining simulations and measurements offset this shortcoming. The simulations can be used to correct the measurements or vice versa. The correlation is improved by adjusting the LIDAR measurements with the WindSim correction tool. How much of an improvement? The averaged relative error is reduced from 6.7% to 0.3% in the example below. The figure on the right shows the correlation between measurements from a traditional mast and from measurements obtained with a LIDAR. 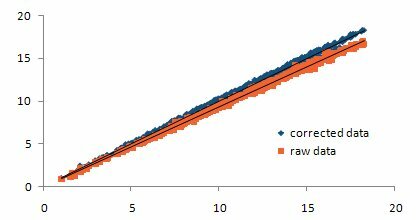 The averaged relative error is reduced from 6.7% to 0.3% using the new WindSim Remote Sensing Correction Tool. The measurements were taken at the CRES Lavrion test facility in Greece. The LIDAR used was the WINDCUBE™ from Leosphere.